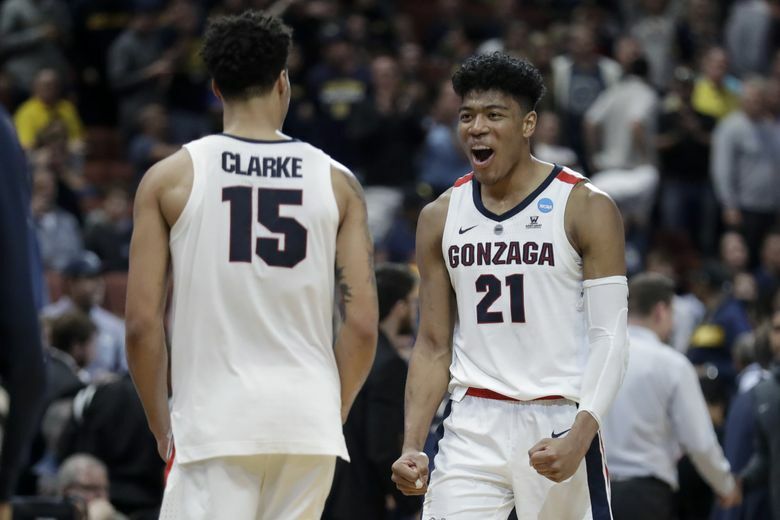 Perhaps you’re in the camp that believes Rui Hachimura and Brandon Clarke are first-round NBA draft picks, and both are probably going to turn pro. Perhaps you’re hoping one or both junior forwards return for their senior season at Gonzaga. You probably have less company. Perhaps you expect both will leave, but you’re optimistic that Killian Tillie and Zach Norvell Jr. will be back next season. You’re not alone. The innumerable NBA mock drafts online can range from informative to clueless. At different segments of the season, we checked in with three people who watch, cover, analyze and scout college basketball for a living. We picked the brains of ESPN’s Sean Farnham, CBS Sports’ Wally Szczerbiak and an NBA scout who requested anonymity for obvious reasons. Hachimura made obvious improvement from his sophomore to junior year. The 6-foot-8, 235-pounder is a consistent scorer with a strong midrange game and an ability to get to the foul line. Hachimura hit 41.7 percent of his 36 3-point attempts this season after making just 22.5 percent in his first two seasons. The 6-8, 215-pound Clarke expanded his game after transferring from San Jose State. He drew attention with high-flying dunks and blocked shots, but also improved his shooting stroke and showed he can work off the dribble. A check of six mock drafts had both going in the first round, with five projecting Hachimura to go before Clarke. One site that compiles a four-mock aggregate has Hachimura at No. 10 and Clarke No. 23. The scout wasn’t quite as sold on Hachimura, noting that he has a chance to be in the lottery because it’s not a particularly strong draft. His primary concern was Hachimura’s shooting form and his ability to connect beyond the NBA 3-point line, which is up to 3 feet deeper than college. Hachimura is a quick, strong driver, but not necessarily a great finisher. The scout was impressed with Clarke’s athleticism, energy level and his improved shooting form. The 6-10 Tillie is a strong 3-point shooter (47 percent on 149 career attempts) but was limited to 15 games this season by injuries to his right ankle and foot. He has nice touch around the basket, but NBA front offices might be worried about his durability. Tillie could be an “off-the-bench” player in the NBA because of his size and versatility as a stretch 4, according to the scout. Tillie and Norvell didn’t appear in the six mock drafts (only two were two-round drafts), but Tillie was in top 100 lists by ESPN (No. 82) and The Athletic (No. 59). Norvell is No. 48 on The Athletic’s big board, but didn’t crack ESPN’s top 100. The scout agreed, noting Norvell is a “hell of a college player,” but he’s streaky and turnover-prone.